We usually eat at the flagship restaurant at 130 Bourke Street but our friend/neighbour told us that Ajisen Ramen had opened another outlet at Melbourne Central. According to Jason, “the food and ambience are better” and besides, Melbourne Central is nearer to where we stay thus saving us some tram fares which would be used to buy us some entrée. 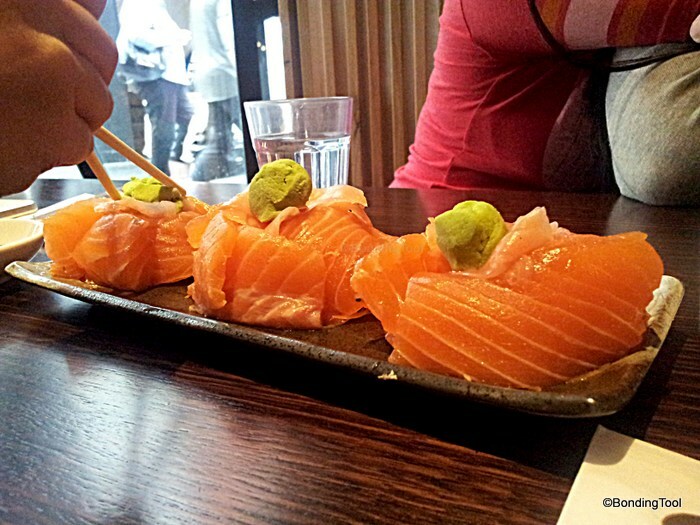 See how fresh the Salmon Sashimi is? 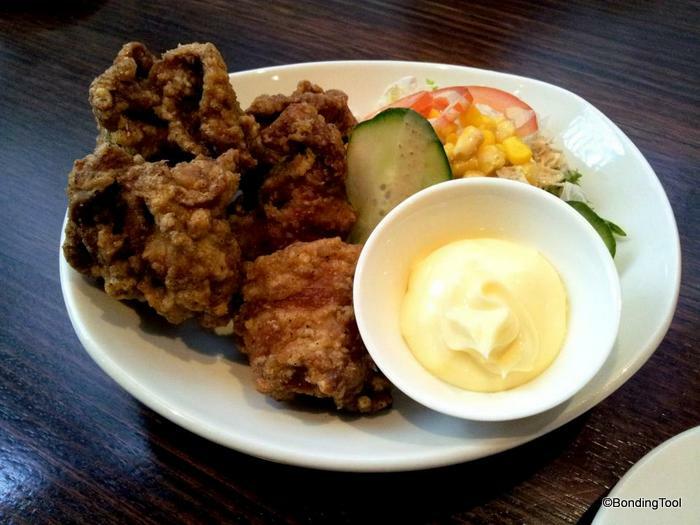 Tori Karaage – deep-fried chicken served with mayonnaise. 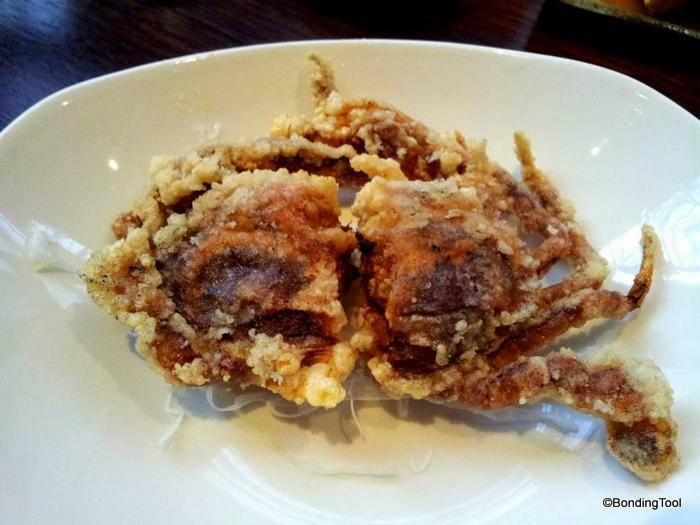 Soft Shell Crab – was a tad too oily that day. 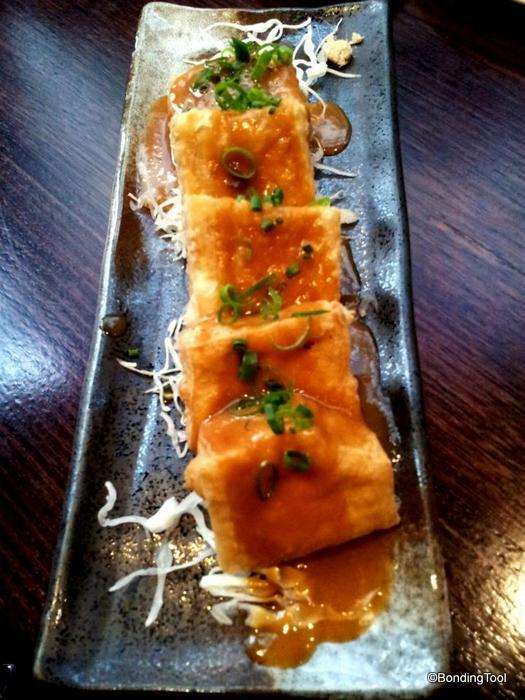 Tofu Dengaku – I find the miso paste a wee bit too salty but the tofu itself was done very well. Volcano Ramen – one of the signature noodle dish with tonkotsu (cloudy pork broth which captured the essence after hours of boiling) soup. Yumz! 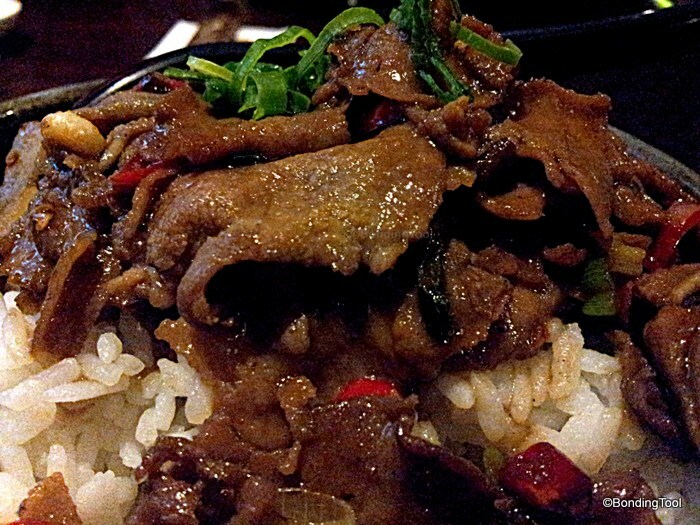 Buttery taste of Gyutan Don is a must try here if you like organ meat. Affordable fast food meal that will not disappoint. Trademark of a little girl named Chii-chan is used on their stores and packed noodles. I hear they have expanded to more than 700 outlets around the world now. BusinessWeek‘s publication in 2007 revealed that Ajisen (then a moderately successful family-owned ramen chain from Kumamato in western Japan but now with a strong growth market in China) were negotiating to buy another two pieces of land in China and when all the new factories are online, they’ll be able to support another 1,100 restaurants. Ajisen Ramen was founded in 1968 in Kumamoto, Japan by Mr Takaharu Shigemitsu. In 1997, Katsuaki Shigemitsu took over as the president of Ajisen ramen after Mr Takaharu Shigemitsu passed away. In 1996 Ajisen Ramen expanded internationally. Today, Ajisen Ramen totals over 750 branches all over the world, namely Japan, Hong Kong, Taiwan, China, Thailand, Singapore, Indonesia, Korea, Philippines, Australia, Canada and the U.S.A.
Ajisen Ramen specializes ramen in tonkotsu soup, which is pork bone soup. It has lots of collagen in the soup which is good for health and prevents aging. Our noodle is made from wheat flour and cooked to al dente. With the addition of Senmiyu (our secret recipe), a rich brown sauce that accompanies the Tonkotsu soup, a bowl of ajisen ramen is tasty, delicious and satisfying. Just as the old Shigemitsu-San saying “å®‰å¿ƒ ï¼Œå®‰å…¨ ï¼Œ å¥åº·” which means assuring, safe and healthy. 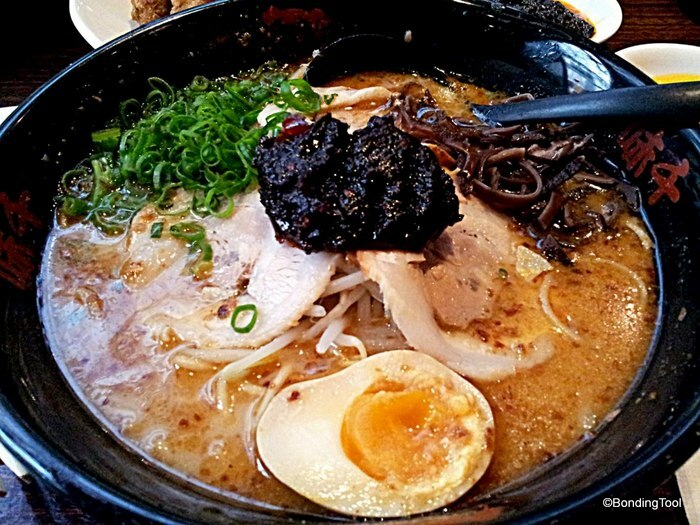 Ajisen Ramen Melbourne opened its first outlet on 11/11/2004 at 130 Bourke St Melbourne 3000. 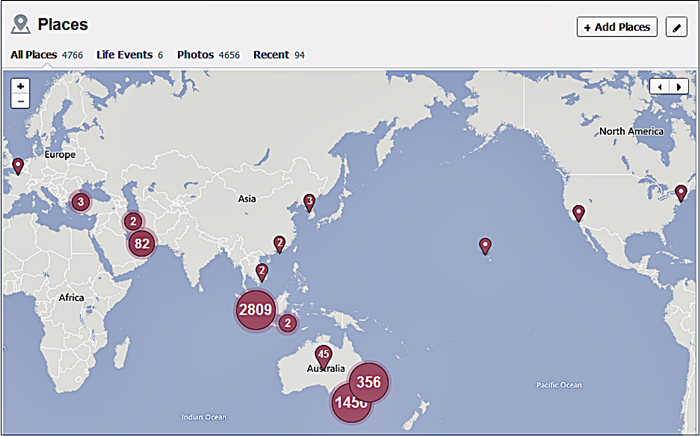 Subsequently Sydney, Brisbane and Adelaide opened it stores. 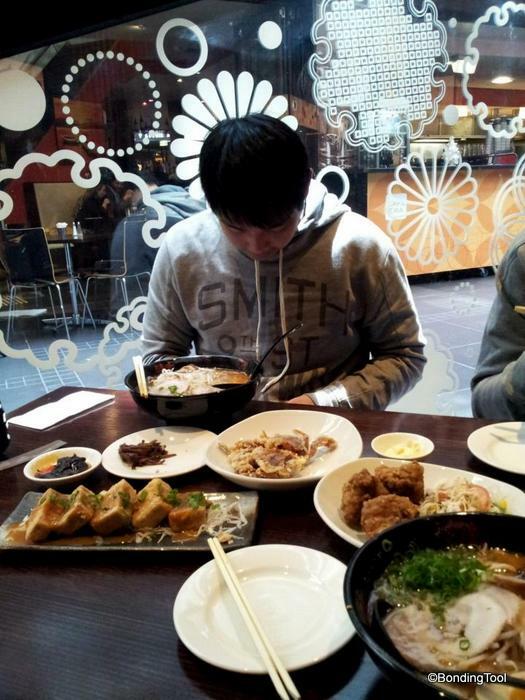 In 2011, Ajisen Ramen Melbourne decided to expand and opened its second outlet at 367 Burwood Rd Hawthorn and the third one at 82 Kingsway Glen Waverley. Our goal is to make sure our customers get the best quality food at the most affordable price and also to follow our headquarter’s motto of always ensure that our food is “assuring, safe and healthy”. 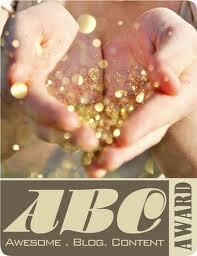 Our aim is also to be the best ramen restaurant in Melbourne. Noodles and key ingredients are mostly imported from Japan and China. Ajisen Headquarter has a factory in China that produces all ramen noodles. Other key ingredients are produced in Japan. Quality is controlled and we have the best ingredients as the key ingredients are sourced in Japan and could not be sourced in Australia and thus differentiate ourselves from our competitors. We try to bring the closest Japanese ramen taste to the people of Australia. P.S. Corporate and Products Information above and the shop’s picture below are from Ajisen Ramen Melbourne‘s website. 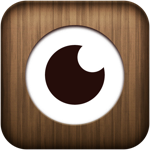 ← Hope(toun) is the Only Thing Greater Than Fear!